We'd heard reports about an Acme Company movie ages ago, but now it's apparently really happening. 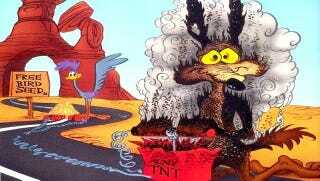 And producer Dan Lin explained to Collider that it's not an animated film, it's a live-action comedy — and Acme's most famous customer, Wile E. Coyote, won't be in it. We're not going to use Looney Tunes in the ACME movie, it's a live action movie. What were so excited about is the lead character is a Steve Jobs meets Dean Cameron kind of character and because it's ACME you can create some incredibly funny, wacky inventions that you can't do on any other movie. So naturally it's just a super imaginative movie. Meanwhile, Lin said there's actually a screenplay for the long-delayed movie of DC's Suicide Squad comic, written by Justin Marks — but it's not actually happening any time soon. Said Lin, "I think Warner Brothers wants to finish their A-list stories first and then we'll talk about stories like Suicide Squad." In the right hands, a Suicide Squad film could obviously be amazing — but only if they're able to nail the bleak, character-oriented tone of the 1980s Ostrander comics.